When I interviewed Alice Waters recently, she started the interview with a question for me: “Aren’t you going to ask me what I had for breakfast?” I think she was probably teasing me. When you’re the doyenne of the sustainable food movement and owner/founder of an iconic restaurant like Chez Panisse, I’m sure there’s always some journalist wanting to scribble down what you ate for brekkie. I finally got around to asking her about it, and she gave an alluring answer: Her morning meal had been a whole-wheat flatbread made with just a bit of olive oil, salt, and baking soda. She ate it, she said, with hummus tweaked with Indian spices. “Eating this little breakfast has really made me very happy,” she declared. I wondered if eating something similar might do the same for me, so I asked Alice for the recipe, and she kindly obliged. I whipped some up for the Maverick Farms crew recently, along with Indian-spiced yellow split peas. And guess what? It made us all really happy too. Soon I’ll try it for breakfast. Combine the flour, salt, and baking powder in a medium-sized bowl. Using a fork, slowly stir in half of the water. Add the olive oil and then the rest of the water, stirring continuously to incorporate the wet ingredients. 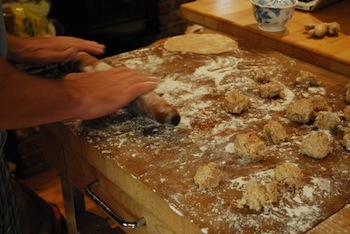 Start to pull the dough into a ball with your hands, adding a little bit more water if necessary, to form a moist dough. Knead the dough for 30 seconds, then cover with a towel and let rest 15 minutes. Form dough into 1 1/4 inch balls. Using a rolling pin, roll balls into a long oval shape. Preheat a 10-inch cast-iron pan on the stove at medium heat. When the pan is warm, cook two flatbreads at a time, turning over when the bubbles start to lightly brown. As you cook the rest of the batch, let the cooked flatbreads rest under a towel. The cooked flatbreads can be kept in the fridge up to one week. Before serving, reheat them individually over an open flame on the stove to toast them. Serve immediately. In a medium-sized heavy-bottomed pot, heat butter over medium-low heat. When the butter has melted and its foam has subsided, add the sliced onion. Turn heat to a gentle medium. Now add the spices. Cook, stirring often, until onions soften. Stir in the garlic, ginger, and chili. Let it cook another minute and add the split peas. Stir to coat with onions. Add the water, bring to a boil over high heat, turn heat to lowest setting and cover. They’ll cook in 40-50 minutes. Check occasionally to make sure they’re not drying out; if so, add some hot water. When they’re done, they should be very soft—a kind of rough paste. Taste, and add a half teaspoon of salt and a generous grinding of pepper. Then taste again. Correct for salt, and serve.